Because of the rapid growth of social media sites like Facebook and LinkedIn, many people are unsure of how they should draw the line between professional and personal communications. It’s a bit of a balancing act, but if you follow a few rules of thumb, you’ll do a better job of managing your professional brand. First off, if you aren’t yet familiar with it yet, LinkedIn has become the hot destination for professional networking. It’s the ultimate social and professional mixer that helps people connect through career experiences. Essentially, you go to LinkedIn to create a living resume. It may help you get discovered by HR recruiters or former co-workers. So it is essential for you to market yourself properly. Here are five easy tips for making the most of LinkedIn. It’s strange to even say this, but you need to treat LinkedIn as you would any other workplace. Consider LinkedIn just another extension of your career, because for now, it kind of is. There are enough working professionals on LinkedIn that you must assume that everything you write is going to be seen and interpreted by some of your co-workers. Based on the title, I had no interest in seeing “Hot Tub Time Machine.” Granted, I typically like John Cusack and Craig Robinson, but this one just looked lame. Then, when the reviews came out, and predictably the movie got some uninspiring reviews. Now, before I go any further, it’s worth noting that people trust their social network. Content is king, but context is what make the content personally relevant. They certainly do not trust the mainstream media. I ignored the critics, hopped in my car, and caught an early showing of Hot Tub Time Machine. Know what? Mike was right. It was very funny, and I’ve recommended it to other people who have memories of the 1980s. And this is why buzz marketing and social media marketing is so important. People have greater trust for the people in their personal social circle than they even do for paid professionals. Disney even recently canceled the iconic At The Movies show after 24 seasons of thumbs up, thumbs down reviews. 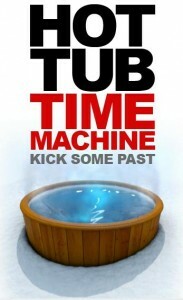 Hot Tub Time Machine clearly isn’t for everyone. It’s not a movie made for critics, but neither are mainstream movies like Avatar. The critics tend to like more highbrow entertainment, which makes sense. In the end, HTTM will probably find it’s audience on DVD and BluRay, which is fine. It’s works just as well in a home theater as it does in a megaplex. Ultimately, the movie will travel organically and inexpensively through social networking channels. Many marketers are still struggling to find that perfect social-media marketing formula, so they can tap it every time, like turning on a water faucet. But that’s exactly why social media is so effective. People trust their social network precisely because it’s not supported by advertising dollars. It’s fueled, instead, by people who just want to share with their friends. And you just cannot bottle and sell that. Jackson Dies. Fans Flock to…MySpace? In terms of media, Michael Jackson’s death revealed some interesting insights in social networks. No, it’s not that people on social networks — like Facebook, Twitter , digg, etc — broke the news to their friends. Instant sharing is at the core of social networking. The big surprise? MySpace became a serious destination for fan outpouring. Yes, MySpace, the site that some industry experts have declared dead. Yes, MySpace, the social networking pioneer that just laid off 30% of their workforce. The King of Pop died suddenly on June 25, setting off a firestorm of news and reaction. Post-event analysis reveals that sites like Twitter and Google were hobbled by the surge in traffic. Google thought the surge in traffic was an organized attack on their site. SIDE QUESTIONS: If Michael Jackson’s sudden death had this effect on the Intertubes, isn’t it time for the government to review the Net’s infrastructure? What would happen in a larger global event? Could the Net handle it? And is it ironic that television (that “old media”) works just fine during major surges? Debate, discuss. As news raged, something weird happened at MySpace. People started to “friend” Michael Jackson’s MySpace Page at an astonishing rate. MediaWeek reported that “the official Michael Jackson MySpace profile was adding 100 new friends per minute.” Um, wow! As of this writing, Jackson’s MySpace page has 567 thousand friends. That’s a lot of friends for a “dead” network. It’s frustrating thing that they don’t offer a comparison. That is, how many friends was Michael Jackson getting per day before his death? Don’t know. And how many songs were they streaming every ten minutes before his death? Again, don’t know, so it’s hard to give a good comparison. Michael Jackson’s surprise death revealed a lot about the way people use the web and social networks. Based on the follow-up coverage, it’s clear that this Internet-thingy still holds a few surprises for us. Yes, Facebook continues to be THE social networking juggernaut. But we knew that already. The biggest surprise for many of the “experts” out there? MySpace isn’t dead.